With the aim of supporting the sustainable development of the Culture Sector, UNESCO sent a technical expert mission to Somaliland from 28 October to 2 November 2016. 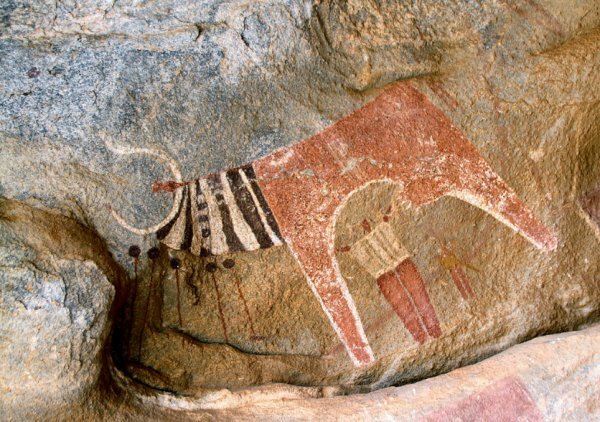 In close collaboration with the Somaliland Ministry of Youth, Sport and Tourism, the mission reviewed the Laas Geel Rock Art site in Somaliland, one of the oldest rock art sites in Africa. The experts undertook interviews with the site manager and local authorities as well as local communities, in order to make recommendations to safeguard of the site. In the framework of UNESCO’s support towards the sustainable development of the Somali Culture Sector, and in partnership and with the financial support of the French Embassy in Kenya and Somalia, UNESCO sent a technical expert mission to Somaliland from 28 October to 2 November 2016 to review the state of conservation of the Laas Geel Rock Art site, one of the oldest rock art sites in Africa and the most important ancient site in Somaliland. Two experts, Prof. Xavier Gutherz, a renowned archaeologist and researcher (one of the first experts to work on Laas Geel), and Mr. Laurent Bruxelles, an expert from the INRAP, French National Institute for Preventive Archaeological Research, and IFAS, French Institute of South Africa, Johannesburg, undertook the mission in close collaboration with the Somaliland Ministry of Youth, Sport and Tourism. The last UNESCO mission to Laas Geel took place in 2010 and was led by a team from the Trust for African Rock Art (TARA) and Kenyan archeologist, Mr. George Abungu. They were accompanied by the former Director of Heritage in Somaliland, Dr Sada Mira. Some of the images from their mission are featured on the TARA Rock Art database, which is now housed through the British Museum. At the time of the 2010 mission, the mission team did not report any serious damage to the Laas Geel site. However, UNESCO has been alerted to threats of serious deterioration over the past years from media, concerned NGOs and individuals. This 2016 mission team aimed to confirm these claims and make recommendations to the national authorities for the improved conservation and sustainable development of the Laas Geel site.